Suzhou is located in the center of the Yangtze Delta, in the south of Jiangsu Province, with Shanghai to the east, Zhejiang Province to the south, Wuxi City to the west and the Yangtze River to the north. Since 42% area of the city is covered by water, including a vast number of ponds and streams, Suzhou is praised as the 'Oriental Venice'. 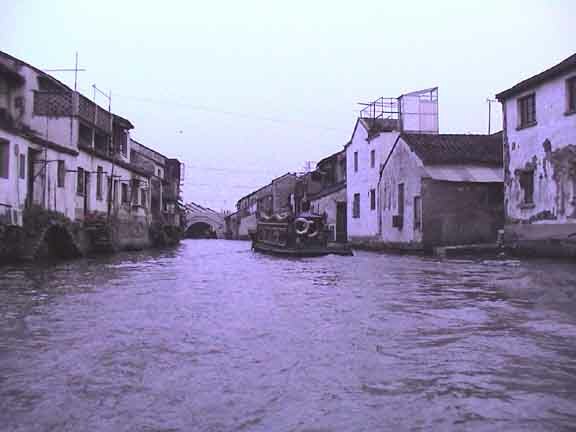 Suzhou, known as the "Venice of China" has an extensive network of canals. View from our canal boat excursion on on an ancient canal with ancient homes and shops which come right to the water's edge. Viewing an old back street and passage way from one of Suzhou's many canals. Suzhou canal boat on a misty evening. Suzhou, canals criss cross the city. Suzhou, dwellings along one of the many canals. Photographs copyright © 2000 - 2006 Rebecca Kali. All rights reserved.